AUSTRALIANS are tired of dishonest institutions and crave the small town personal values of regional Australia, according to the nation's best known contemporary prophet. Regions like Gympie, he said, were perfectly positioned to benefit from Australia's next big episode, the forecast shift from capital cities to neighbouring country towns. 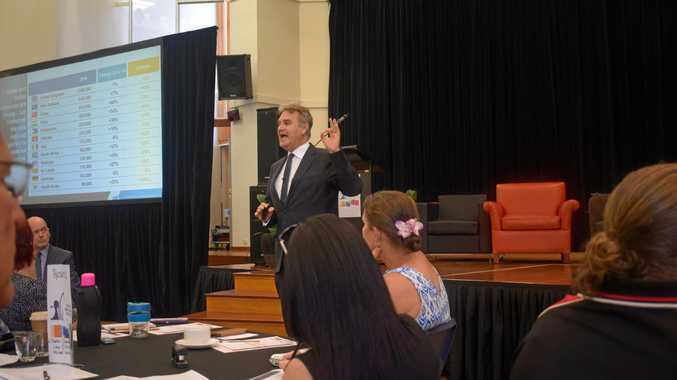 The man who has made a career out of holding up an entertaining mirror to the nation, futurist and columnist Bernard Salt, told more than 250 people at a Gympie Regional Council business breakfast on Thursday that Australians formed one of the most flexible, welcoming and broad-minded communities in the world. This was one reason for its cultural diversity, which he linked to our prosperity and prospects for the future. "I think we as Australians should have confidence in the future,” he said. "We're living in troubling times for many people but I have faith in Australia and I put the case as to why you should look beyond the short term to the medium term bigger picture view of this nation. "Should you invest your youth, your energy, your life, your career, your family, your future into Australia?” he asked. "Yes,” was the clearly implied answer. "We have 25 million people; there are more people in the US state of Texas than in the whole of Australia and yet we are the 14th largest economy in the world (out of 200 nations). And assessments by the United Nations body, the Organisation for Economic Co-operation and Development, tended to indicate things would only get better for a nation tipped also to shift very much in Gympie's direction, he said. In a time of great cultural tension, in Australia and elsewhere, he said Australia's predominantly "Anglo” culture was a tolerant multi-cultural community. This showed in high migration rates and the enthusiastic adoption of food from other cultures. Australia was changing and, he said, regions like Gympie, close to major capital cities, were likely to find the national trend heading our way. Australians in five years had lost interest in big institutions. "Australian people are saying, 'If you want to connect with me it must be local, tribal, communal, regional, authentic and connected',” he said. That was what people were looking for and was the kind of genuine humanity that people find in regions like Gympie. "You could make a case that places like Gympie are sitting squarely in the zeitgeist of the future,” he said.